Weekly Update #273: Is SoftBank Putting All of Its Eggs in the WeWork Basket? Chart of the Week – Is SoftBank Putting All of Its Eggs in the WeWork Basket? Note: Valuations above are illustrative and based on a set of simplifying assumptions as discussed below. For those who follow the venture capital world, few remain surprised by the onslaught of capital being deployed at the world’s leading private tech companies by the Japanese giant SoftBank. Through its $100 billion Vision Fund, SoftBank has essentially established itself as the central bank of venture capital, seemingly printing money for circulation among the elite corporate institutions, except Fed Chairman Jerome Powell is SoftBank CEO Masayoshi Son and Wall Street titan JPMorgan is ride-hailing giant Uber. However, media reports that SoftBank is in discussions with WeWork for a $15 to $20 billion majority investment is making even avid SoftBank followers scratch their heads. A $20 billion investment would be one-fifth of the Vision Fund’s capital, subjecting the fund to significant concentration risk in a position that lost $723 million in the first half of this year. 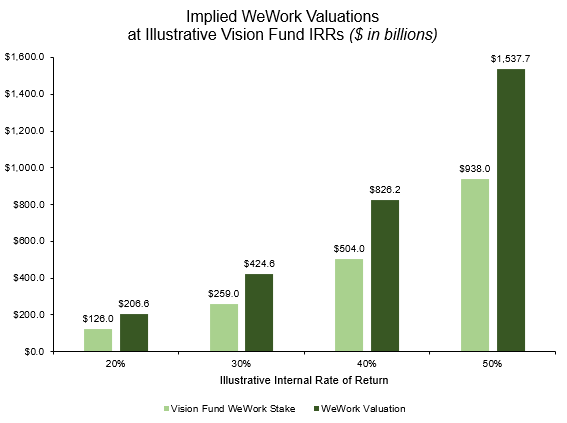 And how big would WeWork have to get for the Vision Fund to achieve competitive returns? Huge. At a 20% IRR, which by all means is respectable but probably still low for traditional VC IRR targets, SoftBank would have to exit WeWork at a $207 billion valuation (this is over 10 times what WeWork is worth today, or roughly equal to semiconductor hegemon Intel). Do we really think WeWork will some day be worth as much as Intel, a company with over three-quarters share in the semiconductors market? Masayoshi Son clearly does. We took the analysis a couple steps further and assumed 30%, 40% and 50% IRRs for the Vision Fund. At these hurdle rates, WeWork’s valuation would have to be approximately $425 billion (roughly Facebook’s current market cap), $826 billion (nearly Amazon’s current market cap), and a gargantuan $1.5 trillion (basically 1.5 times the most celebrated tech company in human history, Apple Inc.), respectively. Wow. The lofty numbers aside, of all the companies in SoftBank’s portfolio, why is WeWork the potential beneficiary of $20 billion? WeWork’s closest public competitor, IWG plc, is worth barely over 10% of WeWork’s current valuation, yet it has twice the number of desks available in its co-working spaces. Moreover, offering short-term rentals is a notoriously cyclical business—WeWork’s fundamental model of taking on long-term leases and offering tenants short-term leases and flexible rents exposes it to serious risks in an economic downturn due to WeWork’s high fixed costs but highly vulnerable revenues. WeWork’s client list still includes a big share of startups that have never experienced a down cycle (and may not survive one). Of course, the current version of WeWork represents only a fraction of what SoftBank and the company hope it will someday become, with WeWork CEO Adam Neumann describing a future of entire neighborhoods home to WeWork co-working spaces, WeWork apartments, WeWork gyms and even WeWork schools. And maybe that expanded vision of WeWork will eventually come to fruition, but will the company get there before the next downturn? Maybe. But if not, SoftBank should be prepared to maintain its new role as the central bank of venture capital, because it might have to keep printing money to keep WeWork afloat. For a deeper dive into SoftBank and its portfolio companies, please see our report from August on the topic.